Many years ago, when I was around 3 or 4 years old, my parents decorated the eating area in our house with a hilarious poster of a smiling, middle-aged Asian guy holding a sandwich he’d presumably just taken a bite out of. Above his head were the words, “You don’t have to be Jewish,” and below it the phrase’s now famous kicker: “to love Levy’s real Jewish rye.” Even as a little guy I was fascinated by that image, and forty plus years later I still find the language from that poster working its way into my head at random moments. Case in point—while I was making the popovers presented here. Now obviously unlike the rye bread from that Levy’s poster, popovers have no particular ethnic association. Still, in their very English, Downton Abbey-ness, popovers do call to mind a certain Anglican attitude that’s the very antithesis of a good deli sandwich. And because the batter they’re made from is essentially the same as the one called for in Yorkshire pudding, and because that dish is for me a key component to any Christmas feast worthy of the title, it naturally made me flash back to that poster’s copy. Or rather, to the copy’s flipside: you don’t have to be Christian to love Christmas dinner. Which is exactly why this recipe from the December issue of Bon Appétit grabbed me by the collar and wouldn’t let go. Years ago, when I was first attempting to prepare a Christmas dinner on my own, I learned that Yorkshire pudding is traditionally made using the fat drippings produced by that aforementioned roast—a rich, buttery payoff that can prove a drag on meal preparation since the making of the popovers must follow that of the meat. 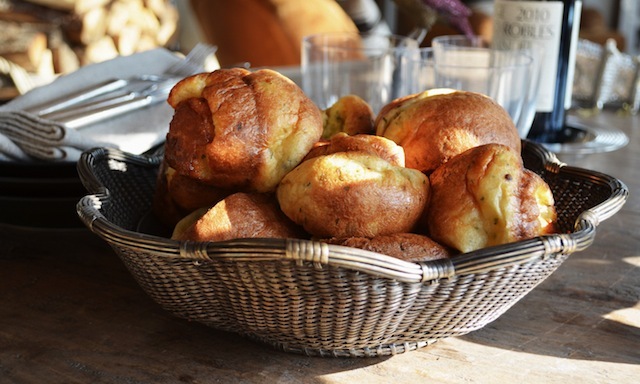 Enter the popover, Yorkshire pudding’s duplicate in all things except form, since the brioche shaped pastry is baked in a muffin or popover tin and not a casserole dish. It’s a difference that can lighten the cook’s load immeasurably, as the popover’s smaller shape seems to respond just as well to melted butter as it does to rendered beef fat (key, since without the warm fat to greet the batter the pudding won’t inflate as desired—an important component to the dish), which means you don’t have to wait until that roast is out of the oven to get things going. 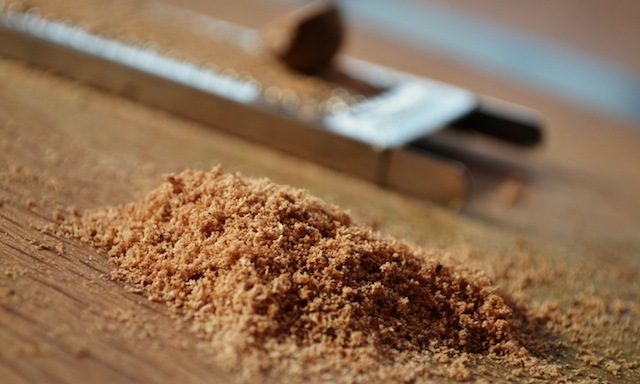 What’s more, it makes for a tidy, individually sized package on everyone’s plate—something that both looks nice and streamlines the serving process. Now you might guess from all this rhapsodizing that popovers are something I’ve made before, and you’d be right. 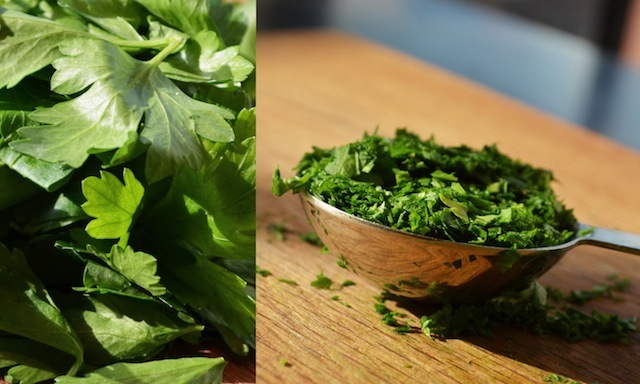 But what prompted me to put aside the more than serviceable recipe I’ve used in the past and give this one a try was its addition of three surprise ingredients: freshly ground black pepper, freshly grated nutmeg, and freshly chopped flat-leaf parsley. In other words, along with the signature flavors of butter, eggs, and flour, the dish now has a little something extra—a subtle bite of heat thanks to the pepper and the nutmeg, and a quiet grassy note delivered by the parsley. As such it’s just the thing to round out the buttery richness of the confection in its most basic state. And it couldn’t be easier to make. To start you whisk together your various dry ingredients (the flour, the salt, the pepper, and the nutmeg), along with the freshly chopped parsley, and in a separate bowl do the same with your wet items (the milk, the eggs, and 3 tablespoons of the butter, melted). Into the egg mixture you gradually add the flour/parsley combo, and once combined you’re good to go—proceeding either directly to the muffin tins, or chilling and refrigerating the mixture for up to a day. This last detail bears underscoring as it’s one more way this recipe serves the harried chef, since any opportunity to get things done ahead of mealtime can obviously lighten the load immeasurably. 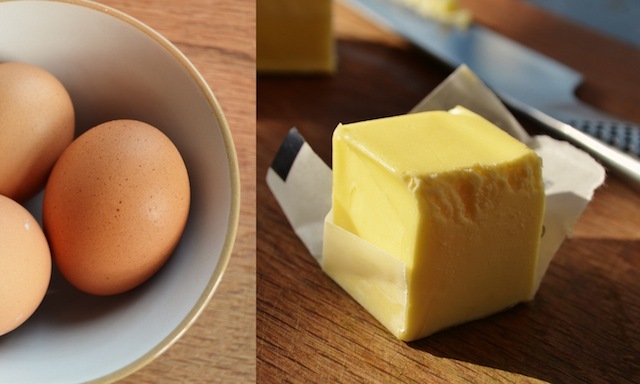 Either way, once you are ready to start baking, douse each cup with a 1/2 teaspoon of melted butter (made from the remaining 2 tablespoons of butter), then fill the muffin tin three-quarters of the way full with the batter. That said depending on the capacity of your tin (although the recipe calls for “standard muffin cups,” and even if you’re using one described as such, there seems to be some variation as to how much it holds) you may find yourself with excess batter. If so, call a second tin into service and be grateful you have extra! All that remains at this point is to bake the popovers in a 425˚ oven for 30 to 35 minutes, or until the dough is golden brown, crisped around the edges, and puffed up like a miniature hot air balloon. (For the record, on each occasion I’ve made these I’ve needed that additional five minutes to achieve the correct level of doneness.) What’s more, although it’s not suggested by the recipe, midway through the baking process you may want to rotate the pan if it looks as though the popovers are not browning or puffing up evenly. If you decide this extra step is called for, however, be sure to move quckly as you don’t want to lower your oven’s temperature and risk deflating the pastry—the source of much of its goodness. Similarly, once the popovers are out of the oven you’ll want to get them to the table immediately, so make sure everything else is ready to serve by the time they’re done. Of course, even a cold, slightly deflated popover can be irresistible—something I tend to experience each Christmas when faced with the dilemma of what to do with the 2 or 3 that remain uneaten (I’ve been known to succumb to temptation and pop one more in my mouth, even after multiple servings of dessert). Still, it’s not a question I anticipate having to resolve this year; with the “secret” ingredients in these popovers, I fully expect they will all be devoured. Seriously, they’re that good. 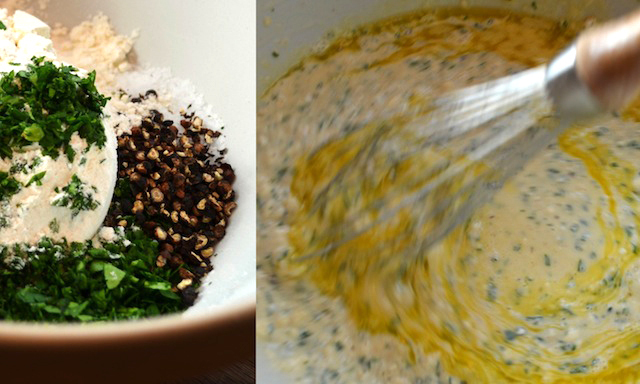 —In a medium bowl whisk the flour, parsley, salt, pepper and nutmeg. Set aside. —In a large bowl whisk the eggs and the milk until well blended. Gently whisk in the flour mixture, followed by 3 tbs of the melted butter (don’t overmix). 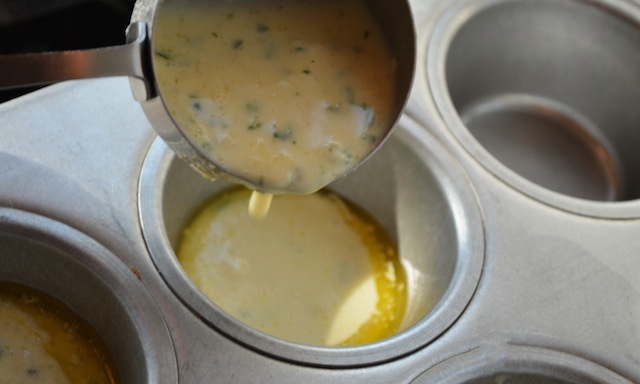 —Melt the remaining 2 tbs butter; grease 12 standard muffin cups with ½ tsp melted butter each. (See TRG note #1, below). —Pour batter into prepared muffin tins, filling cups three-quarters full and dividing equally. 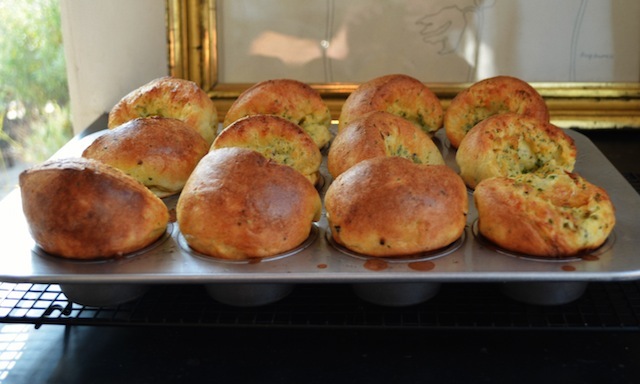 —Bake popovers until puffed, golden brown, and crispy around edges, 30 to 35 minutes. (See TRG note #2, below.) Using a thin knife or an offset spatula, remove popovers from pan. Serve immediately. BA Note #1: The batter can be made 1 day ahead, covered and chilled, and poured into the prepared muffin tin just prior to baking. 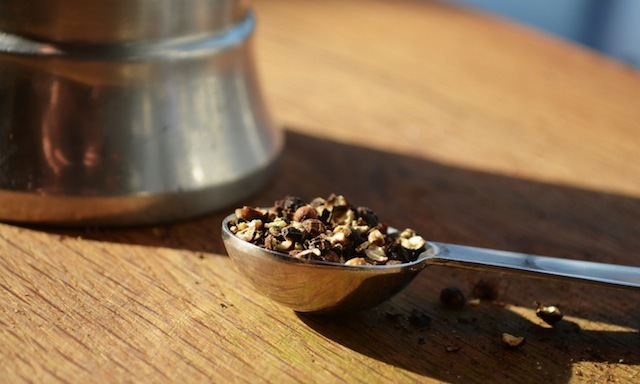 BA note #2: For an intensified flavor, substitute melted duck fat for the melted butter. TRG note #1: Although the recipe calls for 12 standard-sized muffin cups (which should each hold 1/4 to 1/3 cup batter) you may find you’re left with excess batter once the requisite amount has been poured into the cups. If so, call a second muffin tin into service and use the remaining batter to make as many additional popovers as you’re able. 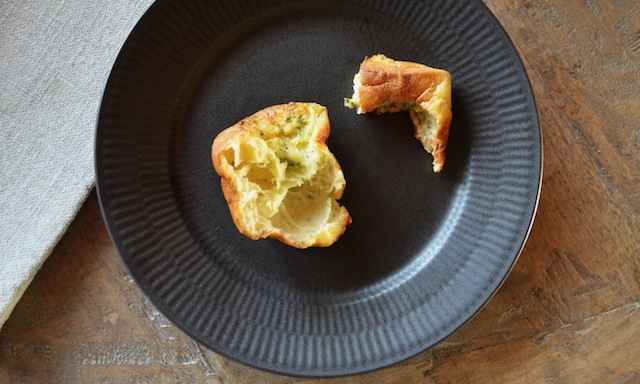 TRG note #2: If the popovers look to be baking unevenly, try rotating the pan mid-way through the cooking process. These look really great! Do you think they would work if you took out the herbs and made it more of a sweet breakfast food? Exactly — Just like the ones at Jordan Pond House (but smaller if you use a muffin tin like I did here). I'm attaching a recipe for the standard, non-herb variety, which is better for the butter and strawberry jam experience I think you're looking for. There's also a good tip here for lowering the temperature 15 minutes into cooking to ensure against deflating. 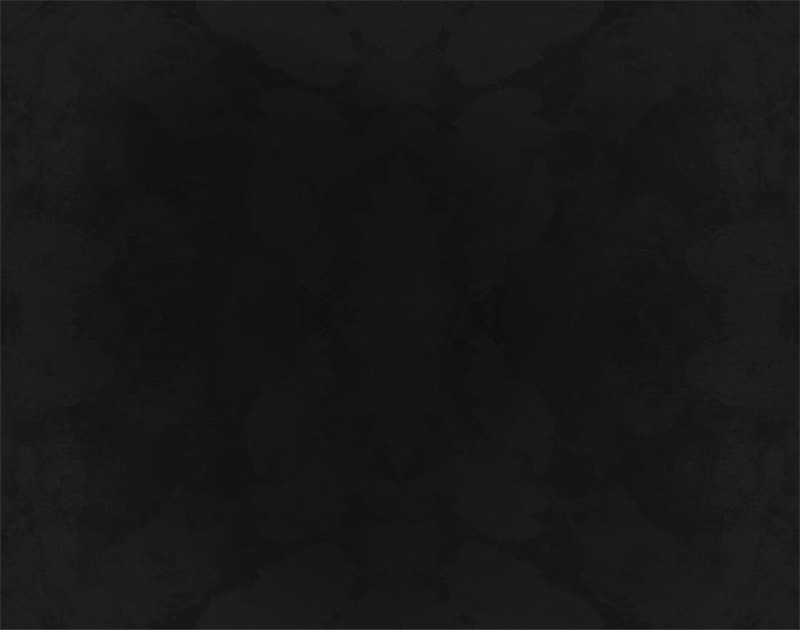 Enjoy, and happy new year!